Note: This checklist is for Xcode 4.3. The most recent checklist can be found here. 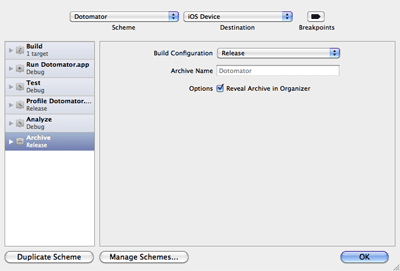 Then in the schemes window, select the Archive (Release) scheme. Set the Build Configuration to Release, enter an Archive Name for your project (this will show up in the Archives window of the Organizer), and check the "Reveal Archive in Organizer" checkbox. a. Click on the Project's build settings. There are several settings to configure. Under Architectures, set the Base SDK to "Latest iOS", and Architectures to both "armv6" and "armv7" (how to add armv6 in Xcode4). c. In the Deployment section, Apple recommends setting Skip Install to Yes* for your Release build. You should also set the iOS Deployment Target to the minimum version of iOS you want your app to run on. You can view the Archive build log by clicking on the Logs tab at the top of the navigator frame. Make sure your app builds all the way to completion, including the Code Signing step at the end. 5. Open the Organizer (Window -> Organizer) and confirm that your newly archived app appears there. Then try archiving again (Product Menu -> Archive).